In the unlikely event that anyone clicks on any of the links in my articles, you may have noticed that I don’t do a lot of linking to the traditional “animal rights” sites. While I agree with (much of) their message, I do not always agree with their arguments (or their tactics), and, because their arguments are often badly expressed, I do not usually find them to be valid references. An example wandered across my Facebook feed today, and I felt compelled to comment. Understanding that I agree completely with the sentiment expressed by this video…I disagree with how it has chosen to convey its message. Speaking of small family farms, where did Mercy for Animals get access to that cow and calf? Did they film collaboratively with a dairy farmer (this is obviously not undercover footage) while he separated a calf from its mother (why did they support him doing this? ), or did they separate someone’s pet cow and calf temporarily, just for a commercial? Did they lie to a farmer and say they were filming for something else? Why did they need to film this anyway? It’s not like they don’t have already have much more relevant footage. They have plenty of terrifying shots, from real farms, on their YouTube channel, including this much better example of the same argument, which uses actual dairy farm footage. This is NOT meant to be an attack on Mercy for Animals, which is just trying to do the best they can, and is actually doing a very good job getting a lot of multilingual (good for them!) videos out there spreading an important message. This is more a puzzled look at one of my least favorite trends in all pro-animal advertising (and many, many groups have made ads like this, not just MFA) — weird advertisements which trip over their own feet trying to make a point. All Mercy for Animals had to do was air, say, this footage, with a voiceover: “Is a piece of cheese worth this?” What’s with the unreal setup and scenery? Photo by Kamuelaboy on Morguefile. An article about a hog farm in Owensboro, Kentucky crossed my radar today, and pinged it for all the wrong reasons. The farm, which is attempting to curb the spread of a rather horrible-sounding disease called porcine epidemic diarrhea, or PED, is in the news because its effort to protect its animals involves grinding up the intestines of dead piglets which have died from the disease and feeding the resulting “smoothie” to the adult sows. The procedure, called “controlled exposure“, is actually standard practice. It attempts to establish “herd immunity” in an infected farm by exposing all adult animals on the farm to the disease as quickly as possible. 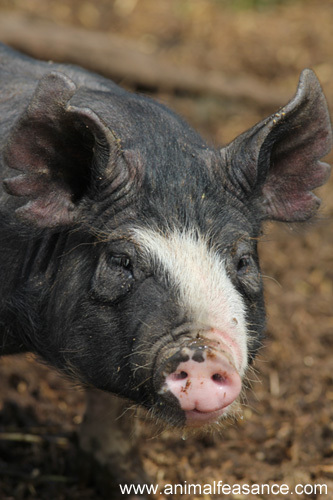 (The virus has a mortality rate approaching 100% in suckling piglets, but most adult animals recover without incident.) Since PED is an intestinal pathogen, adult animals are most easily infected by exposure to the “intestinal tract” of “infected neonatal piglets”, which should be “sacrificed” within the first six hours of clinical signs for “maximum viral content”. Once they recover, the now-immune adult sows will pass on antibodies against the infection in their milk to future litters of piglets, keeping those piglets protected from the virus and giving the farm time to perform some serious hygienic measures and actually eradicate the virus. Gestation crates. Photo from HSUS, via Wikimedia Commons. The Humane Society of the United States, which broke the original story, points out that keeping pigs in natural conditions is a more ideal way to prevent the spread of diseases such as PED than feeding dead animals to live ones. (It also notes that feeding dead animals to live ones is against state law in any case, although I cannot find that reference online at the moment.) The farm in question is a large factory farm and its sows are maintained in industry-standard gestation and/or farrowing crates, which are noted for providing just as much room as a pig needs to exist (not turn around, not move, just exist) and not an inch more, on the grounds of “protection” for the sows from each other, and for piglets from the vast and frightening bulk of their mother. The sows spend their lives crammed shoulder to shoulder in steel frame boxes the exact length and width of their bodies, churning out litters of piglets. This kind of atmosphere does not promote healthy, happy animals. Which brings me to what pinged my radar: the name of the farm in question is Iron Maiden Hog Farm. Iron Maiden Hog Farm! I am at a loss to think of a more classless name for a pig breeding operation. I somehow cannot bring myself to believe the facility is named after the band, can you? My original thought was “veal calves” — although the original photo source says “Holstein dairy calves” on a Wisconsin farm, and these do appear to be dairy calves. There are theoretically good reasons to keep dairy calves this way; however, for a huge variety of reasons, this is not a location in which I’d personally be comfortable working. Maybe that’s why there’s a shortage of workers? Recent news articles have brought my attention to the farming of the guinea pig as an alternative meat animal. Apparently it’s popular in South America, where it’s known as cuyes or cuy. People eat them whole roasted, rather like tiny chickens, and the author of the NPR piece goes into entirely too much detail about eating the “fingery little hands”. I am aware that humans will eat just about anything, so it’s not too much of a surprise that someone, somewhere, is eating guinea pig. The guinea pig is supposed to be more “eco-friendly” than, say, beef — it’s more efficient at turning food into meat and it certainly takes up a lot less space. Heifer International provides guinea pigs (amongst many other species) to people in developing countries to provide meat and income. So there might be benefits to farming guinea pigs instead of cattle or pigs. This is what it looks like when you move from “pet” to “farm” — much less space per animal, more animals in one room. If guinea pig meat becomes popular, these little farms will want to — will need to, to keep up with demand — become even more “efficient”, cramming more animals in the same area. What will an “efficient” guinea pig farming operation — capable of feeding several hundred thousand humans — look like? The presentation of the issue is somewhat simplistic: it assumes that only a few cows are raised in the hypothetical pasture (i.e., it’s not a feedlot, the American standard); that “pasture” is equivalent to unspoiled natural land; that all the wildlife in the field are killed by the plow; etc. I think it’s a valid notion, but the solution to this issue is not to have everyone eat nothing but red meat. The problem lies more with how we produce our food, and what methods we’ve adopted to produce that food cheaply, and less with exactly what food we are producing. For example, we can certainly develop methods to raise and harvest crops more sustainably and with less “collateral damage”. I don’t think we’re really able to exist, at all, without causing some damage to the world. It’s in our nature as consumers of energy — it’s got to come from somewhere. However, we can choose to minimize the amount of damage we cause, and try to choose the least damaging places to cause it.